This is Old Jack’s second book of ghost stories. Old Jack takes us to the old Roman city of Chester. Who is the soldier walking along the old city walls? And why is his uniform covered in blood? Who is the ghost in a hotel in Shropshire? Why does the ghost do bad things to women guests? Hampton Court Palace in London is a famous tourist spot, but it has a tragic history. Very late at night, when the palace is closed, some people who live near the palace say they can hear a woman in the palace. She is screaming. Who is she? Why is she screaming? And why do some visitors feel ill in the palace gallery? The Tower of London is also a famous tourist spot. But did you know that it has an animal ghost? 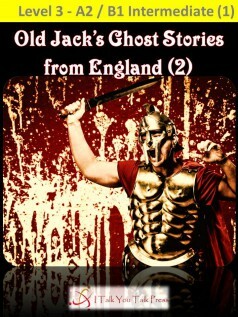 Enjoy six more of Old Jack’s ghost stories from England!